Once upon a time, there was a girl with a 35mm camera who liked to take portraits of her bestest friend in the world. 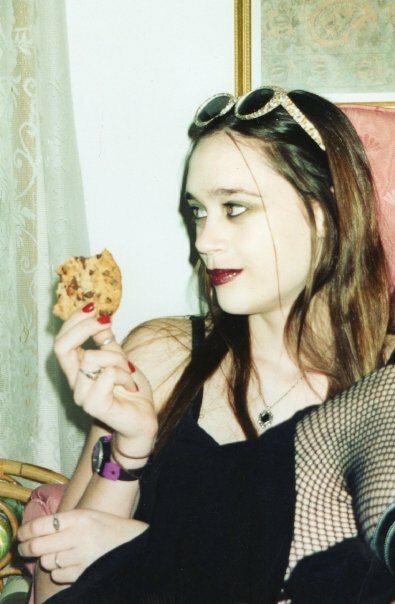 She would give her props, like cookies and leopard print sunglasses and ask her to wear fishnet stockings for effect. When she was done taking pictures of her photogenic friend, she would walk around her neighborhood, taking pictures of everything she saw. Wherever she went, her camera followed. That was her life in high school...and then she thought she had to grow up. This is going to sound really cliche, but I've always loved photography. But at some point during high school, I decided that I needed to focus on figuring out what I wanted to be when I grow up and photographer was not an option. I stepped away from something I loved because I didn't think it was possible (or accepted) to become successful doing something artistic. I needed a real job-a real career. Photography is not a real job. Guess what happened, I went to college for something practical...and I hate it. I have spent the past ten years suppressing the fact that I am, in fact, a creative, artistic person. Well, I'm not going to do that anymore. I have come to the realization that being successful has much less to do with how much money you make and more to do with how excited you are to wake up and do what you do every morning. Being happy and excited about work is the biggest measure of success for me. And I'd be happy taking pictures and creating stuff (design and writing) for the rest of my life, so that's what I'm going to do. One of the items on my 30 Before 30 list is to find a job I actually like. Well, I'd actually like being a photographer. So, I'm going to do that. And you're going to help me. In order to make a serious attempt at a career in photography, I need to build my portfolio and in order to do that, I need to take pictures. Here's how you're going to help me: I want to take YOUR picture. For free. Boom. I know a bunch of you readers are in the New York Metro Area. What I'm proposing is this: If I can get to you using my MetroCard, I will take your picture. And I'm not just talking about a few portrait snapshots. I'm willing to take pictures of ANYTHING! Want a couple's session with your guy? Okay. Need some pictures of your kids? No problem! Want professional pictures of your Etsy listings? I'll take them! Are you already a photographer and need a second set of hands on a shoot? I'll be there! Let's review. I'm not the best, but I realize that the only way to become the best is to practice. This is a win-win situation, people. You get pretty-ish pictures of whatever you need pretty-ish pictures of and I get practice using my camera. I can't promise perfect images, but I can promise that I will try my best to shoot perfectly. Okay, who's in? P.S. I'm only going to be accepting free clients through May 31, 2012. I have to eventually make some cashola to feed my husband. Thank you for your understanding. I admire you for going after what you love to do. I am so happy and excited for you!!! I think you have a very bright future ahead of you. And, I would love to take you up on a free session! Maybe pictures of me and Brian? Or just me for new blog buttons or something? Let's discuss! Good For You, Love!! Anything I can do to help you, let me know! I'd love to book a session for my Peanut;) Wishing you nothing but all the success in the World!! I think this is so great what you are doing! I came to the same realization myself and I am glad I am not alone! I realized that sometimes you just have to do what makes you happy! I am still trying to figure out what I need to do but I am so happy that you have found what makes you happy and are actually going for it! I do have a good looking family and we really never took a family portrait and I never took pics of me and the hubby before only for our wedding so we should make arrangements!!! I'd love to do personal trainer professional portraits. I need to think up some ideas but I can go down to you or bring you up here. Either way. That's so neat, I wish I lived near you. Good for you love! I considered being a photographer for awhile but after doing a few sessions and maybe 4 or 5 weddings I decided it wasn't for me. But one of my best friends owns her own photography company up here in Maine, LOVES it, and was able to totally quit her dayjob within a year of doing it! I wish you all the best of luck! Congrats on going after something you love. I have a blog but would like to take some fitness pictures for my personal training business, I have a few ideas that will go with my personality although i would have to find a location to take these pics because i would like to take them at a gym.